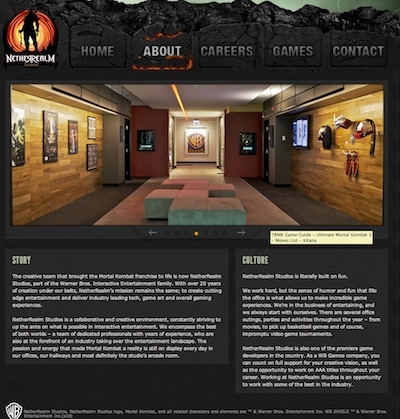 Ever since WB Games Chicago was renamed NetherRealm Studios back in June of 2010, their studio website at www.netherrealm.com had nothing on it but their logo. When compared to other WB Games studios, like SnowBlind it felt really lacking. But the void was acceptable because they were in the middle of putting together Mortal Kombat (2011). Now that the game is all but done, they finally have a proper home. Below is a thumbnail of their newly website. The new www.netherrealm.com allows them to post things like news and updates, the story behind the studio, their current job openings, photos of the studio, and their list of games which is sure to grow. I'm sure with the news function alone there will be plenty of reason to return to this website for some of the latest happenings after Mortal Kombat (2011) is released.